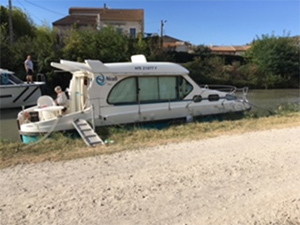 I keep a boat on a marina at Cap d’Agde, less than half an hour by sea from the Canal du Midi, so why on earth would I want to hire a boat for a week’s cruise on the Canal? The answer is actually quite simple because my own boat with her two big petrol engines and limited accommodation is totally unsuitable for use by four adults and three dogs on inland waterways. 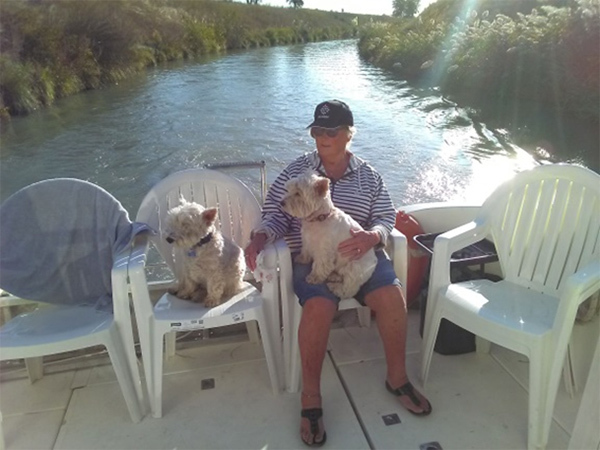 Although my wife Lois and I had been on a short cruise on the Canal du Midi some years previously our friends Malcolm & Jill, despite being experienced sailors, never had, and nor had any of our three dogs. So what was the reference to the RNLI in the title of this article all about? Well Malcolm, Jill and I are all former Coastguards, while nowadays Malcolm is the Operations Manager for the Weymouth Lifeboat, I’m the Weymouth Lifeboat Area Sea Safety Officer and a member of the Merchant Navy Association, while my wife Lois is a members of the Weymouth Lifeboat Events team; to my surprise, and with a rather nasty shock, I realised that between us we have over eighty years’ experience in maritime search & rescue operations! 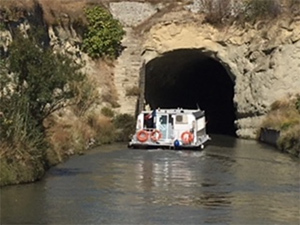 So with that sort of experience between us what could possibly go wrong on a gentle cruise on the beautiful Canal du Midi you may ask? 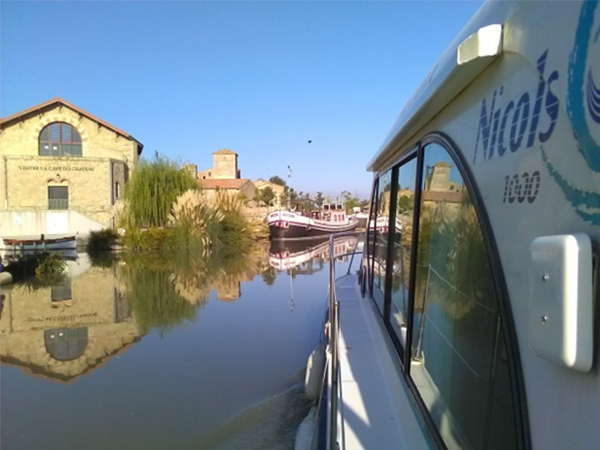 We met our friends at the Nicols base in the beautiful old village of Le Somail south-east of Carcassonne and boarded our cruiser, a 33 foot Sedan N1000 with three cabins and two showers/WCs hired from Nicols one of the leading French hire cruiser operators. Once aboard we took full advantage of the very helpful and informative briefing provided for all their clients by one of the local Nicols staff members which familiarised us with the layout and operation of this particular type of cruiser, which being one of the least expensive models in the Nicols fleet had a single diesel engine and no bow-thruster, which as pretty experienced seafarers seemed likely to suit us best. 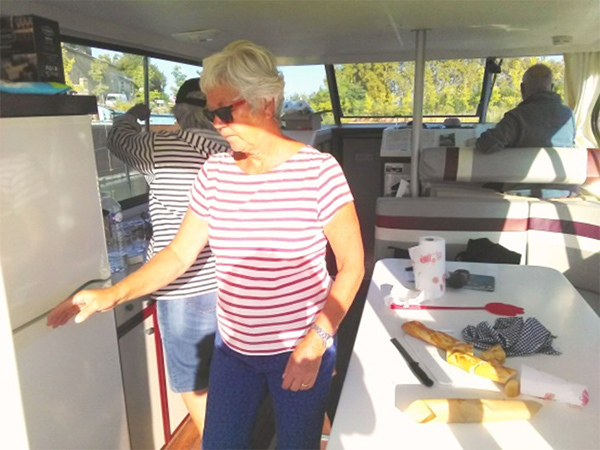 So after the briefing we set off in early evening sunshine south-eastward along the canal towards Argeliers and Capestang planning to moor-up, cook a meal and spend our first night aboard alongside the canal-bank. Our original plan was for us to have a cabin for each couple with the third (smallest) cabin being for the dogs – two Westies (Alix & Donald) and a Cockerpoo (Stanley) but unfortunately we’d forgotten to consult the dogs about this and they had other ideas for their sleeping arrangements – our two in Lois’s and my cabin and Stanley in with Malcolm & Jill in theirs! We moored up using the two heavy metal stakes and mooring lines provided on-board for that purpose, with one stake driven into the bank about 4m astern and the other a similar distance forward, after which we man-handled the dogs ashore over the side (this was before we discovered the passerelle, or gang-plank stored on the roof of the saloon) for a walk following which we enjoyed a good hot meal and having made long journeys by car that day to get to Le Somail to pick up the boat we retired relatively early to bed. The weather forecast had indicated that a breeze might set in during the evening but in fact during the night it blew a good deal stronger than forecast and at about 3 am Malcolm quite wisely decided to check our mooring lines; unfortunately despite trying to do this very quietly he succeeded in waking Lois who in turn woke me saying “someone’s trying to get aboard the boat!” at which point I sat up suddenly and smacked my head hard on the cabin ceiling resulting in a nasty cut above my eye which bled profusely all over the sheets! Fortunately it didn’t require stitches and the contents of the 1st aid box on-board were sufficient to stop the bleeding after a few minutes. By now it was a quarter to four and we’d had enough excitement for one night so we got back to bed and slept through until about 9 o’clock! So much for our first night aboard! The morning dawned bright enough at first but with a quite chilly wind but with only the narrow and very low bridge at the former commercial canal traffic port at Capestang (the lowest on the Canal du Midi) and the narrow 160m long MalpasTunnel (said to have been built by the Canal du Midi’s designer and engineer Pierre-Paul Riquet in just six days!) to negotiate before our next planned overnight stop at Colombiers we were really very relaxed even though steering in the increasing wind required quite a bit of concentration especially when meeting oncoming traffic on the many narrow and twisty sections of the canal; so Malcolm and I took it turns to take the helm for a couple of hours at a time until we moored up alongside the canal bank just outside the village of Colombiers on the old Domitian Way Roman road and now with a very smart village centre including a modern marina extensively used by hire cruiser operators. 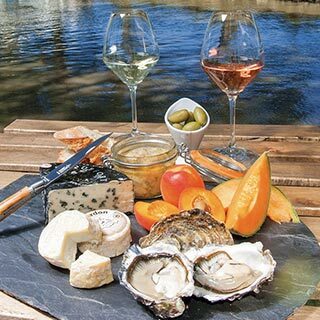 As it was Malcolm’s birthday we’d booked an evening meal here at Colombiers in a very nice, albeit quite expensive, restaurant named Au Lavoir where we enjoyed a very good meal in very pleasant surroundings and where our three dogs were also made very welcome! (And they were pretty well-behaved too). The next morning dawned rather grey and with quite a strong wind about Force 5 which served to encourage us to stay put longer than we’d planned so we ended up spending the day buying supplies of food, taking a stroll around Colombiers and walking the dogs along the canal towpath, followed by a second night here before setting off again to negotiate the flight of seven locks known as the Fonserannes Staircase where the canal descends more than 20m into the valley of the River Orb before reaching the city of Beziers. 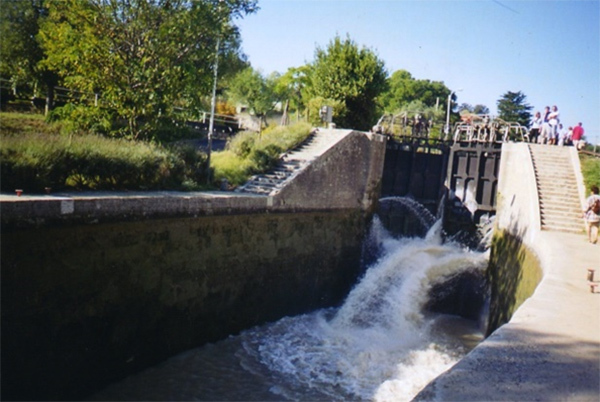 There are fixed hours for going up or down the Fonserannes Staircase so we took our place in the small queue waiting to go down and were eventually waved into the first lock by the lockkeeper. 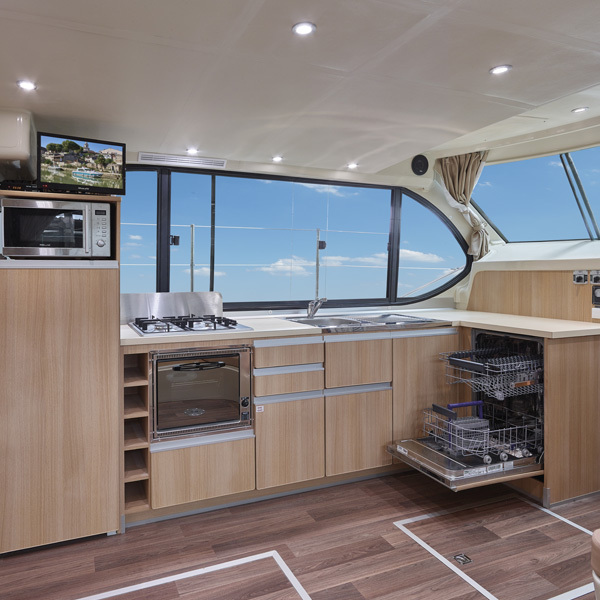 I had the helm on the descent through the staircase and I chose to take the upper helm position on the flybridge which had the advantage of a better view but the disadvantage of less precise gear and throttle positions due to wear and exposure to the wind and weather. It wasn’t a serious problem but it made it slightly difficult to find neutral and on occasions I was unsure whether the boat was creeping forward or back due to the wind or the current or whether it was because it was still in gear and the prop was still turning slowly…. In fact our descent through the locks was relatively easy despite a fresh breeze and a large hire cruiser crewed by a party of Germans who were determined to overtake us, which they duly did as we simply pulled over to the bank and let them by, we managed to get down through all the locks without any incidents which is more than could be said of some of the other boats including the one that had overtaken us! 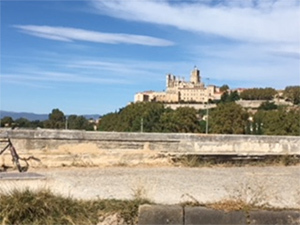 Approaching Villeneuve-les Beziers we’d agreed we need to moor up and take on fresh water and the Guide Fluvial chart indicated that there are freshwater connections just the far side of the bridge and the lock. Once again we had quite stiff breeze so we decided that one of us, on this occasion me, would disembark just short of the bridge, cross the road on foot and wait on the far side of the bridge and the lock ready to moor up at the water point. In the end it was all a bit of a fiasco because by the time we’d moored up and walked the 50m to the office to buy a token to turn the water supply on we discovered that we’d have to wait until the next morning because at that time of year the water connection is switched off on Sundays and Mondays! 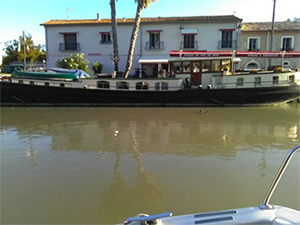 So we ended up staying alongside overnight and enjoyed a good meal at the La Cremade bistro on the opposite bank where there were two large converted 30m long live-aboard barges moored alongside waiting overnight to go on up-stream to their winter moorings at Castelnaudary when the lock opened the following morning. We still had hopes of getting to the Port of Marseillan on the Etang du Thau before turning back for le Somail but life goes slowly on the Canal and the breezy weather, a problem finding a nice overnight mooring at Agde coupled with the fact that we’d arranged to meet some old friends there who have a boat at Cap d’Agde meant that in the end we stayed a little longer than intended at Agde and decided to turn back there and have a more leisurely cruise back to Agde; turned out to have been a wise decision because the following day the wind was even fresher. 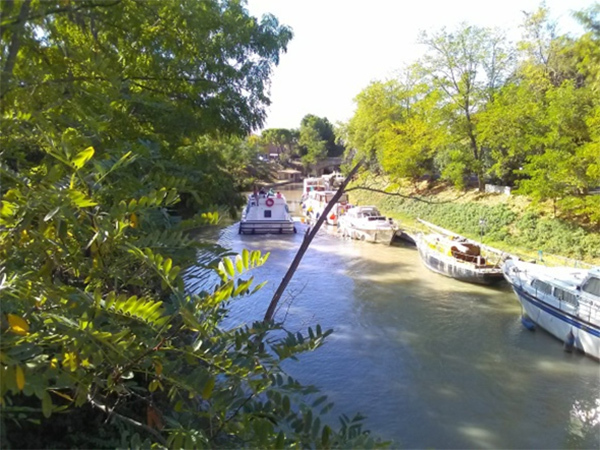 The cruise back from Agde to the Nicols base at Le Somail was mainly uneventful although we did have quite an interesting time negotiating the up-stream passage through the locks on the Fonserannes Staircase largely due to the fact that the French skipper of the yacht immediately ahead of us was single-handed apart from his dog and for some reason insisted on towing his inflatable tender behind his boat rather than stowing it on deck – we never understood why but it was a real nuisance to us because instead of his boat taking up about 10m of space in the lock he was needing anything between about 13 metres and 15 metres depending on now closely the tender was to his boat! There were also a couple of occasions when the French skipper was nearly dragged overboard by his mooring lines too which would have been a really serious accident, but on both occasions Malcolm and Jill were both ashore tending our own mooring lines and were therefore able to help with the French yacht too. 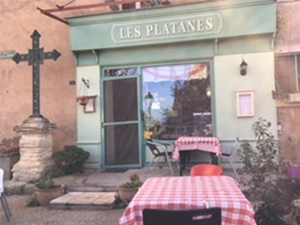 We had a very pleasant stop at Poilhes and took our three dogs for a wander round the village before adjourning for lunch at a very nice little bistro by the name of Les Platanes. 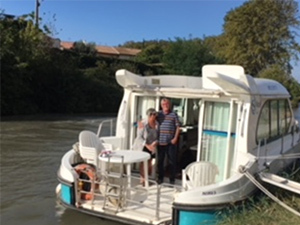 We decided we’d prefer to get the boat back to Le Somail on the Friday evening rather than early on the Saturday morning to enable us to make a reasonably quick getaway to our respective onward destinations as early as possible after we’d cleaned the boat and had it inspected. We’d done no damage at all despite some very windy conditions at times and a couple of near misses (not our fault of course!) But we had needed to replace one of our mooring ground spikes as a result of leaving one in the ground by accident when we unmoored from a rather overgrown bank on one occasion. 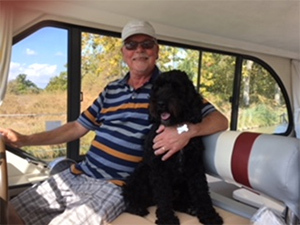 So after a really brilliant week’s cruise we rather sadly handed over the boat vowing to repeat the exercise again the following year – and indeed we’ve already booked on what’s beginning to look like a rather optimistic assumption that after Brexit we’re still able to go to France with our dogs!